You can derive by how many 👎 reactions these comments received that they’re not appreciated by others. Why might that be? Because every new comment on the issue gets emailed to every person subscribed to the issue. Imagine how much mental energy is wasted by thousands of developers having to open/delete these emails which provide zero value. I get upset just thinking about it. Why is this happening? Surely folks know that we can show our support for Issues using emoji reactions. 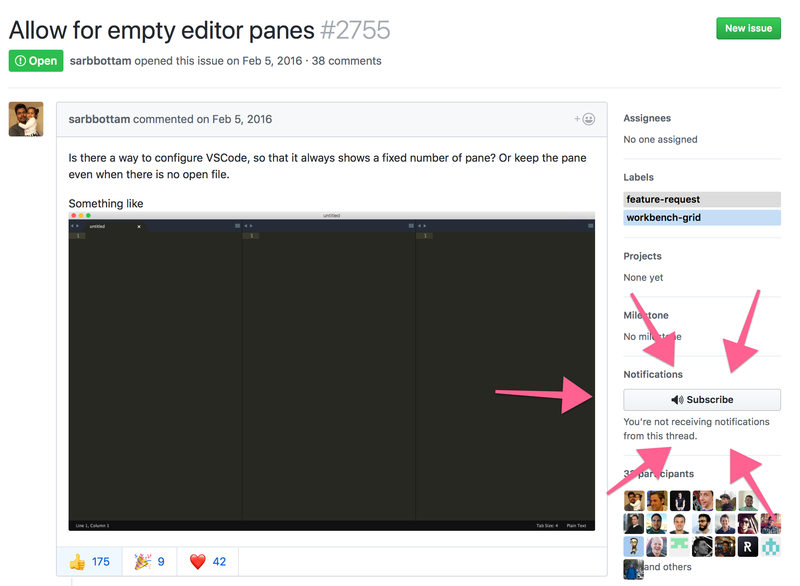 GitHub introduced that feature over two years ago. It’s not exactly undiscoverable, either. Emoji reactions are used en masse. These +1 comments themselves have received multiple reactions, after all. Which begs the question: why do people still feel compelled to comment like that? This is actually true, to a degree. When you only look at the list of issues, comment count is a stronger indicator of support/interest than reactions simply because reactions aren’t displayed there. You can sort by number of reactions, though. Many people might not realize this (I did not until digging deeper in to this). 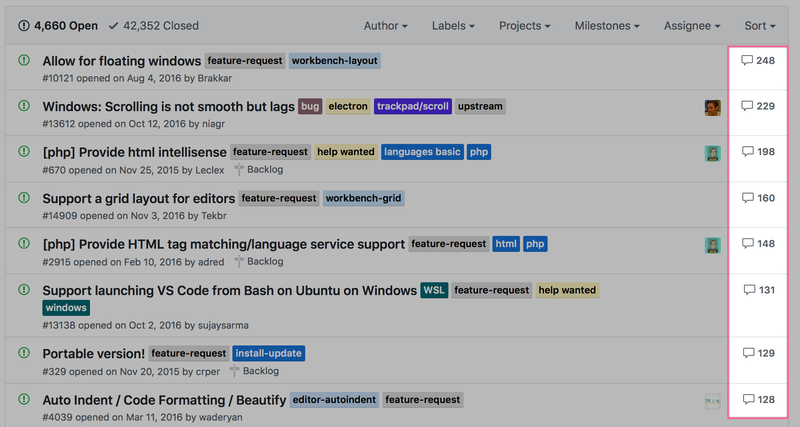 But if anybody does realize you can do this, it’s probably project maintainers who are seeking out these indicators. This overall signaling-of-importance problem is easily2 fixable by GitHub’s product and engineering teams. They could promote reactions to the same level of importance as comments by surfacing them somehow in the list view. But ultimately, I don’t think this is why people do +1 reactions. It’s too nuanced and thoughtful 3. It has to be something more basic, more self-serving than that. I think this is it. 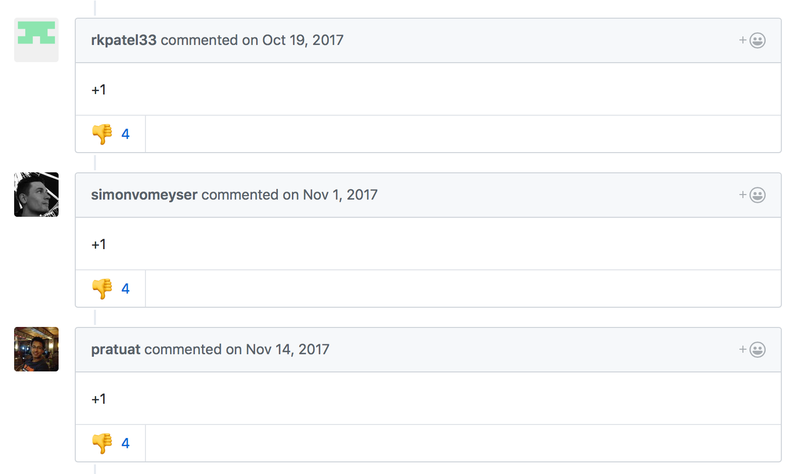 Historically the only way to get notified of updates on a GitHub Issue was to comment on it. I’m not sure when GitHub made this a separate feature, but I’m pretty sure it was a long time ago. Old habits die hard, especially when you’ve never realized there’s a better way. Subscribing directly via GitHub can be awfully noisy (especially with all those +1 comments rolling in) when all you want to know is if/when an Issue gets closed. That’s why our friends at Thoughtbot built a nifty little service called Tell Me When It Closes. It does exactly what’s on the tin, so hopefully no further explanation from me is warranted. If you find yourself in this spot, you want to go to there. What’s better than a PSA? A robot to do our bidding!4 It would be a super cool service to the whole community if someone created a GitHub bot to detect these comments and kindly point folks to the desired actions of subscribing and 👍ing the Issue5. Maybe a good excuse to take Probot for a test drive? !